Cylinder kit from Polini, big bore racing with a 52mm bore and a 44mm stroke, 94 cc. Polini Big evolution cylinders goes into the classes above the 70 ccm. With the Big evolution cylinder line,Polini has come out with 2 cylinders. The first is a 84 cc (with original 39.3 mm stroke) and/or 94 ccm (in connection with 44-mm stroke). You will need to bore the engine case, see directions included for exact instructions on how to 9do this as per your model of scooter) Performance-related to the 84-ccm-Version should be on the level of the 70-ccm-cylinders, however with clearly more torque. If you will want more power,who does not, you should go with the 94 cc version. 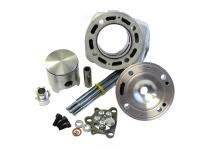 This cylinder kit must be fitted with the crankshaft code 210.0023.